From time to time, every moderator, meeting chairman, or in-depth interviewer needs fresh ideas to jazz up a tired group or reenergize a flagging meeting. 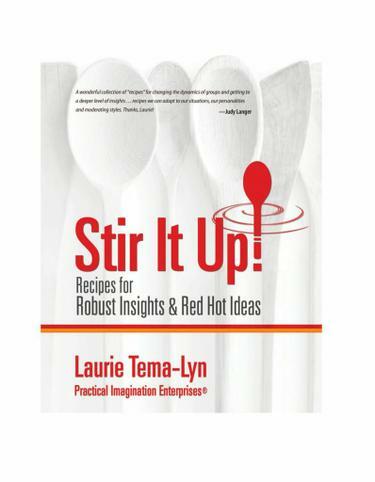 Laurie Tema-Lyn offers more than 50 fresh ideas for exercises in her book, Stir It Up! Recipes for Robust Insights & Red Hot Ideas. Patricia Sunderland, a partner in Practica Group LLC, says, "Laurie's 'cookbook' is a gift, destined to become a resource for novices as well as seasoned chefs in the art of facilitating focus groups, meetings, or events." Laurie Tema-Lyn is the founder of Practical Imagination Enterprises , an innovation and qualitative research consultancy. In Stir It Up! she shares exercises she has used to help her clients recharge their thinking. An active QRCA member, she is currently co-chair of the Philadelphia chapter and managing editor of QRCA Views magazine.